Berry Bend Campground. sits on a promontory reached via short causeway on the Osage River Arm of Harry S Truman Lake, 29 Miles from Clinton Missouri, 18 miles from the junction with Highway 13 and 11 miles from Warsaw Missouri. Here’s a link to our directions on How to get to Berry Bend Campground. In common with most of the campgrounds on Truman Lake, one of the loops of Berry Bend is open almost all year round. Berry Bend does close for a couple of days for special hunting events – so always check. As of 2014 the A loop is closed year-round except on major holidays. The Corps of Engineers’ website states that the A Loop sites are available for for walk-in camping – you’ll need to talk to the camp hosts to sort that one out. We need to go back and re-visit Berry Bend and find out exactly what is and isn’t possible. We particularly like Berry Bend because this a great part of the lake to take the kayaks on, with lots of areas to explore. There are plenty of campsites at Berry Bend with lake access so we can launch straight off the beach, and there is also a 25 mile equestrian trail which is great for hiking. 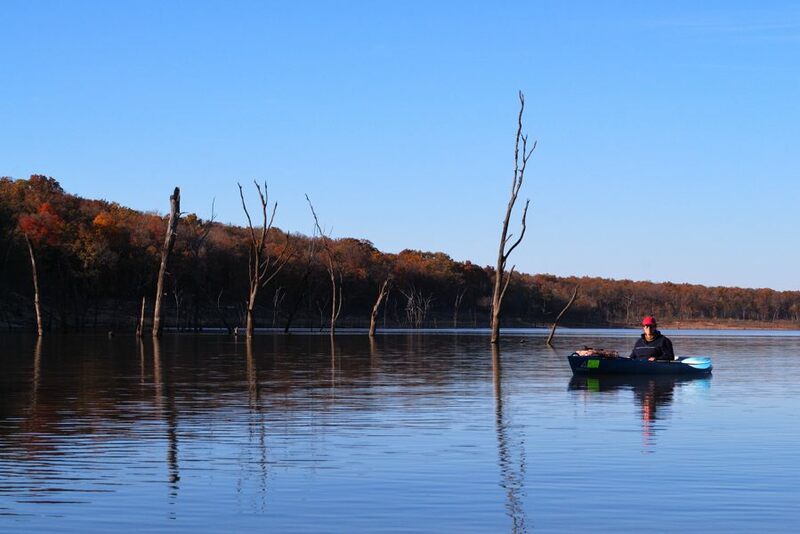 Truman lake itself has around 950 miles of shoreline – that’s a lot to fish and explore. Our favorite sites A20, A47, C92, C54, C14. Open year-round Yes. The C loop is open year round, except for special hunting days. The A loop is only open on major holidays. The Corps of Engineers’ website states that the A Loop sites are available for for walk-in camping. Amenities The sites are well shaded, and a large number of the sites have a path to access Harry S Truman Lake. All sites have a fire ring, picnic table and lantern post. There’s a near-by boat put-in at the day use area. and you can hike on the 25 mile equestrian trail. There is playground equipment for children and a swimming beach. There are a few things you need to know about Truman Lake. The water is very silty, so visibility is limited – when I’m fishing I use noisy and brightly colored lures. Truman is also quite a new lake and there are a lot of dead trees in it. Great for the fish, but a nuisance to lures and motor boats. A great thing about kayaking is that you can get right in the trees without fear of breaking your prop. Unusually for the Ozarks lakes, Truman appears to have quite a current at times. Finally, we’ve noticed that the lake gets a lot of farmland run-off, rich in nutrients. The silty water stops sunlight reaching far down, but we have noticed a foot or so band of green algae around the shore. Google street view showing the junction of State Highway Z with the road to Berry Bend Campground. The Campground is about 2.5 miles down this road. Once you pass the Equestrian Campground and boat put-in (both on the left), Berry Bend is just a short distance after crossing the causeway. Note: watch out for wildlife and horses on the road in this area. Excellent work on the page! Thanks for all of the information. Thanks for the feedback. We’re glad you found it useful. our family camped here last yr during doe season. we had a wonderful time and the campsites are very nice and clean. we are expecting to be back this weekend. thanks for a pleasant experience that we are hoping to make tradition. I was wondering this being a gov campground is it going to be shut down on the 19th & 20th? the gov shut down has shut down a lot of parks and we wanted to come to warsaw for Heritage days and camp at Berry Bend as we have for the past 5yrs. Unfortunately I do not know the answer to that question. Some campgrounds run by concessionaires have remained open with limited facilities. Berry Bend does have independent hosts, but I have no way of knowing if they are keeping the campground open. Checking the Internet archives of the Corps of Engineer’s Website for Berry Bend, I did find one information phone number you could try: (660)438-3872 Hopefully someone will be there to answer it. what about camping fee’s?? tent’s camper etc?? Fees change over time so we don’t post them. We do provide links to the official website, from where the information can be obtained. We don’t normally post links to specific information because the pages have a habit of being moved with no notice. Sorry. However, here’s a link direct to the current fees page: http://www.recreation.gov/camping/berry-bend/r/campgroundFees.do?contractCode=NRSO&parkId=73080 Hope that helps.